Reports from early adopters in New Zealand and studies conducted in Europe indicated that weather can have a strong impact on cow traffic when animals are managed in a pasture-based system. They identified that rainy and windy conditions slow down voluntary movement, whereas traffic to the dairy is increased with hot temperature as cows traffic to the dairy facility in search of shade. Studies conducted in Israel, highlighted the importance of considering a whole system approach within a simulation model to design an automatic milking system (AMS) in a hot climate, where cooling locations are effectively integrated within the system. During hot weather cows typically reduce feed intake and actively seek shade and water to reduce the metabolic stress on their bodies. This can negatively impact on the occurrence of voluntary milking in an AMS operating with voluntary traffic, thus reducing milking frequency and milk yield. The average temperature-humidity index (THI) threshold for reduced milk production is around 68 (approximately 22°C at 50% relative humidity). Above this cows’ production is affected. However, the impact of THI on AMS cows’ production is unknown. Furthermore, shade is known to be effective in alleviating heat stress in dairy cattle, however, the impact of providing shade at the milking facility of a pasture based AMS on time taken to voluntarily enter a milking unit was also unknown. Ms Ashleigh Wildridge completed her PhD at The University of Sydney (Australia). Her research project focused on ‘Management and infrastructure considerations and their impact on cow behaviour and welfare in pasture-based automatic milking systems’. One of her first studies involved collecting data from 6 pasture-based AMS farms in Australia. Data for the summer period (December to February) included milking frequency and milk production from farm software, as well as temperature and humidity from the closest BOM weather station. For every increase in average THI unit, milk production decreased by 0.15 kg MS, with the effect on milking frequency and milk yield lasting several days. In the second study, approximately 300 lactating cows milked in a pasture based AMS were divided into two groups. Each group spent 4 weeks in a SHADE (accessing a predominately shaded pre-milking yard) and a NO-SHADE (accessing a predominantly non-shaded pre-milking yard) treatment. On average, cows in the SHADE treatment were found to take longer to enter the milking unit than cows in the NO-SHADE treatment (SHADE = 11.40 min, NO-SHADE = 8.70 min, P < 0.001). The SHADE treatment was also associated with reduced lower average respiration rates (SHADE = 68 bpm, NO-SHADE = 73 bpm, P < 0.001), increased feed concentrate consumption (SHADE = 6.50 kg/day, NO-SHADE = 6.39 kg/day, P = 0.03) and increased milk yield (SHADE = 11.44 kg/milking, NO-SHADE = 10.95 kg/milking, P < 0.001). Overall, SHADE made available to the cows pre-milking appeared to improve cow performance and comfort (as indicated by reduced respiration rates), despite having an increased voluntary waiting time for milking. In an AMS operating with voluntary cow traffic, providing cow cooling requires more consideration as it can cause congestion. Increased fetching of cows to encourage additional milkings before and after particularly hot weather may be useful to potentially reduce the expected decline in milking frequency and, to some extent, the reductions in milk yield. For more information on these studies please contact Ms. Ashleigh Wildridge (ashleigh.wildridge@sydney.edu.au). Ms Wildridge was an invited speaker at one of our webinars, talking about ‘Managing heat stress in pasture-based AMS’. Watch this video made by an AMS farmer about ‘Heat management on an AMS farm with a mobile shade shed‘. 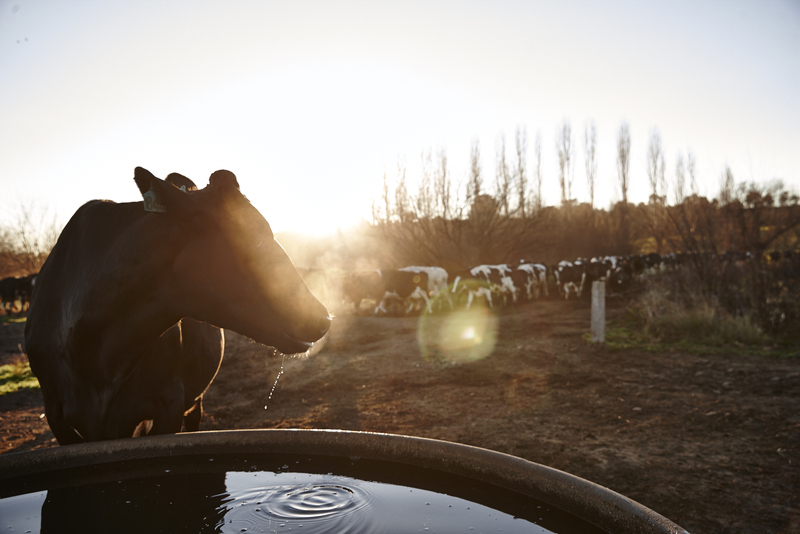 For more information on the importance of keeping AMS cows comfortable in hot and humid weather, please refer to an article published in The Australian Dairyfarmer magazine. Any data on heat tolerance of Jerseys vs Fresians?